od Ivana Horbec · 13. veljače 2018. U časopisu Povijesni prilozi – Historical Contributions objavljena su četiri izvorna znanstvena rada izrađena temeljem prezentacija na V. kongresu hrvatskih povjesničara (Zadar, 5.-8. listopada 2016.) u okviru sekcije “Povijest obrazovanja i školstva”. Sekciju je moderirala dr. sc. Vlasta Švoger, a pokrenuta je na poticaj znanstveno-istraživačkog rada koji se provodi u okviru projekta “Od protomodernizacije do modernizacije školstva u Hrvatskoj”. The Noble Military Academy at Wiener Neustadt was opened in 1752 at state expense, and the aim of the Habsburg authorities was to make it a counterpart of the Theresianum Knight Academy (founded in 1746 under the Jesuit administration). Young noblemen were trained there for work in civil service, while the academy at Wiener Neustadt was intended for officer education. Maria Theresa secured scholarships for ca. four hundred cadets from poorer noble families, as well as for sons of deserving senior officers. Boys under the age of 14 attended the so-called Preparatory Military School in Vienna before being admitted at the Wiener Neustadt Noble Military Academy. Both institutions were merged in 1769 into one Imperial and Royal Theresian Military Academy. Teachers, who were at first only secular, that is, coming from the officer class, continued the tradition of humanist and baroque knight academies and the adoption of “knightly skills and military virtues,” aimed at the acquisition of physical readiness rather than the contemporary knowledge of warfare needed to professionalize the army. This paper presents the reforms and changes that took place at the Theresian Military Academy during the reign of Maria Theresa and Joseph II with the intention of modernizing officer education and developing the supra-national “Austrian patriotism” based on the Enlightenment principles as the main foundation of the future officers’ loyalty. These efforts culminated during the command of the enlightened pedagogical writer, the Austrian general and Bohemian aristocrat, Franz Joseph Kinsky (1779-1755), whose educational concepts and actions are here extensively presented. This paper presents how the 1848 – 1849 revolutionary turmoil gave rise to the political and social atmosphere that enabled the realisation of certain liberal ideas, political rights and freedoms, freedom of learning and instruction among others, and gave the crucial incentive for the beginning of modernisation reforms in the education system of the Habsburg Monarchy and Croatia. Education of young generations as a basis for the future and a precondition for modernization and progress in all spheres of social life has always been an important subject matter for the intellectuals, especially since the Enlightenment, and for the highest administrative structures of European monarchies. In Croatia, it is still an urgent issue. Although the history of education and school system is not a novelty in Croatian historiography on the regional, local, or national level, it is one of those research topics that abound in under-researched or only partially researched issues and aspects. A comprehensive, synthetic overview of the history of school system and education in Croatia is also missing, at least one that would be written in accordance with modern methodological approaches. 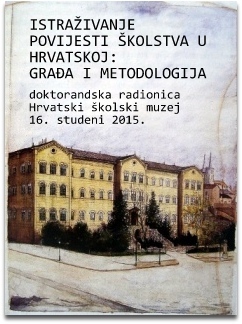 Today, interdisciplinary and comparative approaches to the research topic, the use of relevant and international scholarly literature, and the innovative models of interpretation make it possible to reach fresh and interesting insights linked to the history of Croatian school system and offer a new interpretation of the previous research results. 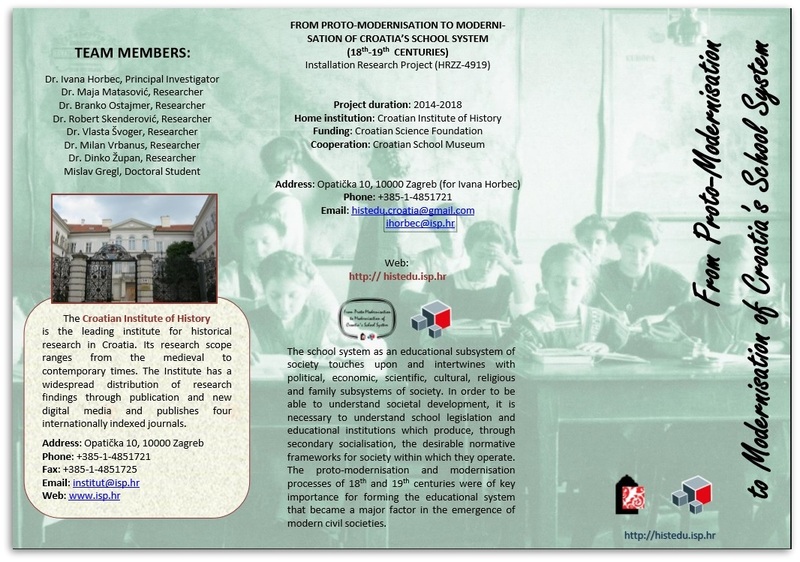 Within the project “From Proto-Modernization to Modernization of Croatia’s School System (18th and 19th Centuries)” at the Croatian Institute of History, coordinated by Ivana Horbec and financed by the Croatian Science Foundation, an idea emerged during the application process for the 5th Congress of Croatian Historians (Zadar, October 5-8, 2016) that a special session should be dedicated to the history of school system and education as part of the Congress’s official programme. Scholars participating in the said project and various other prominent scholars researching on various aspects of the Croatian education system and its history were to present their research results and exchange experiences and ideas for future projects. Despite the short preparation time, the session titled “History of School System and Education” was successfully held on October 6, 2016, with ten participating scholars and moderated by Vlasta Švoger. The presented papers covered the period from the 18th to the late 20th century. Teodora Shek Brnardić from the Croatian Institute of History presented her research on the military education of Habsburg officers at the military academy of Wiener Neustadt, with an emphasis on the reforms carried out at the time when Count Franz Joseph Kinsky (1779-1805) was the commander of the Academy. Ivana Horbec from the same institute held a paper titled “Education against Political Conflicts: Teaching Public Law at Austro-Hungarian Schools of Higher Education (18th Century). Milan Vrbanus from the Croatian Institute of History – Department for the History of Slavonia, Syrmia, and Baranja in Slavonski Brod spoke about the “Resistances, Conflicts, and Contributions: Organizing the School System in Slavonia during the 18th and the First Decades of the 19th Century.” Vlasta Švoger, Thematic Strand on the History of Education in Croatia Gregl presented the work of the Royal Academy of Science in Zagreb during the war (1809), while Vlasta Švoger from the Croatian Institute of History discussed the revolutionary turmoil of 1848-1849 as an important incentive for reforming the Croatian school system and that of the Habsburg Monarchy. Sonja Gaćina Škalamera, museum consultant at the Croatian School Museum in Zagreb, spoke about the Teachers’ Association (1865-1891), the oldest in Croatia, while Sergej Filipović from the School of Technology, School of Natural Sciences “Ruđer Bošković,” and the Faculty of Humanities and Social Sciences in Osijek presented his research results on the solidarity strike organized by the students of the Major High School in Osijek in 1912. Branko Ostajmer from the Croatian Institute of History in Zagreb spoke about the teachers in the Civil or Banal Croatia during World War I, and Dinko Župan from the Institute Branch of Slavonski Brod presented his research on the operation of the Student Mensa in Osijek (1920-1930) as an example of solidarity with the socially disadvantaged students. The session ended with Vanni D’Alessio from the History Department at the University of Rijeka and the Department of Social Sciences at the University of Naples, who held a paper titled “Italian Schools in Rijeka and Istria after World War II: Yugoslav National Policy and the Minorities.” The editorial boards of Povijesni prilozi and Časopis za suvremenu povijest showed interest in publishing the papers from the “History of School System and Education” session and it was agreed that the papers covering the period until the mid-19th century would be published in Povijesni prilozi and those from the period after that in Časopis za suvremenu povijest. The thematic section in Povijesni prilozi thus includes four papers from the session. Ivana Horbec’ in her article The “Quiet Force”: The Role of Legal Education in the Disciplining of the Hungarian and Croatian Nobility in the 1760s analyzes the Habsburg educational policy concerning the Hungarian and Croatian nobility during the 1760 as it sought to overcome the conflict of interest between the traditional class system and the proto-modern state. The political disciplining of students became an integral part of the curriculum, a trend that intensified with the reform of legal education, which defined the relationship between the ruler and the estates and between the state and its inhabitants, as well as the rights and obligations of political subjects, with an emphasis on the importance of public good, prosperity, and the needs of the time. In her article The Upbringing of Competent and Patriotic Officers: Military Education at the Theresian Military Academy in Wiener Neustadt (1752-1805), Teodora Shek Brnardić presents the process of education and training of patriotic and efficient officers at the Theresian Military Academy in Wiener Neustadt. The author analyzes the reforms introduced at the Academy at the time of Maria Theresa and Joseph II, aimed at modernizing officer training and at enhancing a supra-national “Austrian patriotism” with the help of Enlightenment tenets, which was to become the foundation of loyalty instilled in the future officers. Milan Vrbanus’ article Resistance, Conflicts and Contributions to Organising Education in Slavonia in the 18th and in the First Decades of the 19th Century presents the process of building a network of primary schools in the Slavonian part of the dioceses of Pécs and Bosnia-Syrmia at the turn of the 19th century. Based on various archival sources of ecclesiastical provenance and those resulting from the operation of the county authorities, the author analyzes various conflicts and resistances that arose related to the new schools, as well as the contribution of noblemen, parish priests, and Franciscans in their foundation. The thematic section on the history of education concludes with Vlasta Švoger’s article The 1848-1849 Revolutionary Turmoil – Incentive for Changes in Croatia’s Education System. 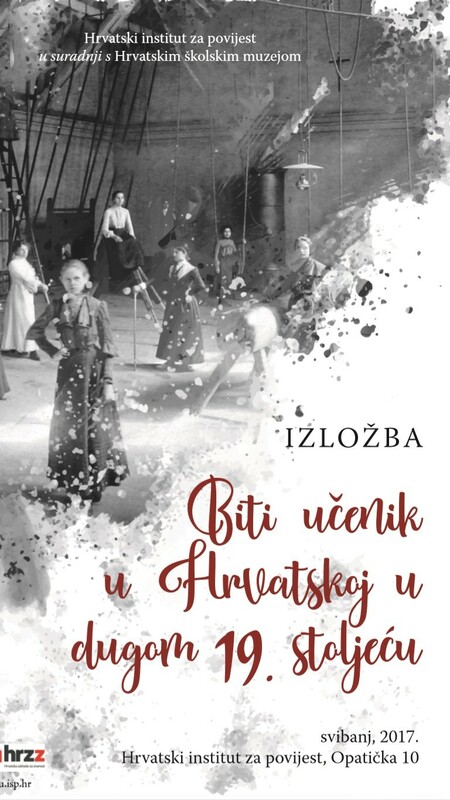 The author shows how the revolutionary turmoil of 1848-1849 created a favourable social and political climate for introducing political and civic freedoms and rights, among other the freedom of learning and teaching, and for modernization reforms in the Croatian system of education. The analysis focuses on the modernization efforts of the Education Department at the Ban’s Government and the political journalism of the time as a forum for debating the problems and perspectives of the Croatian school system. 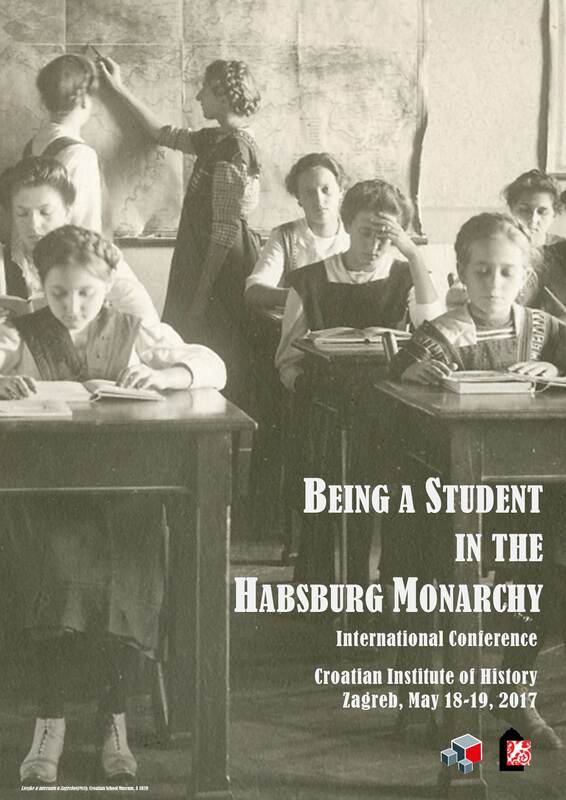 With their variety of topics and methodological approaches, the four articles shed light on some insufficiently known or neglected aspects of the history of Croatian education system as an integral part of cultural, intellectual, and political history. We hope that they will be an impetus for further research on these intriguing issues.